Completing a recent study, TopConsumerReviews.com recently announced the top benefits of a debt settlement program. TopConsumerReviews.com provides independent reviews for thousands of products, including debt relief programs, in order to help consumers make better informed decisions. After completing a recent study, TopConsumerReviews.com has announced the top benefits of a debt settlement program. TopConsumerReviews.com provides independent reviews for thousands of products, including debt relief programs, in order to help consumers make better informed decisions. If debt settlement is determined as a viable solution to relieve a bad financial situation, consumers can benefit in a number of ways. When the debt settlement process is completed, the consumer's expensive monthly payments are eliminated and they're are able to meet their financial needs. That means the endless credit card payment cycle stops and they can begin saving money again. It may also means that credit card accounts are closed and applying for new accounts could be difficult, at least, for a period of time. The endless phone calls from creditors and collection agencies will stop once the debt settlement process has been completed. If several creditors are calling each day, from morning until night, it will be a huge relief to have the phone stop ringing. When consumers stop paying their bills on time and in full, creditors may attempt to take legal action against the consumer. Signing up with a debt settlement program allows consumers to avoid creditors taking legal action, once the account is settled. Debt settlement also allows consumers to avoid bankruptcy which can be very damaging to a credit report for at least the first seven years. Debt settlement doesn't initially help a credit score but, over time, consumers find their credit score improving as they build up their credit. Compared to the alternative of continued late or missed payments, compounding debt related to late fees and interest, a settlement will eventually be better for a credit report. "Debt settlement is not the answer for everyone with large credit card debt," explained Brian Dolezal, of TopConsumerReviews.com, LLC. "However, eliminating debt through debt relief programs can have a number of positive effects. For most people, the piece of mind that they can make ends meet, creditors stop calling and they feel much more financially stable are the top benefits. Another option that many consumers find beneficial is debt consolidation. This allows consumers to make one affordable payment to a lender." To find out more about debt relief companies, including reviews and comparison rankings, please visit the Debt Relief Programs category of TopConsumerReviews.com at http://www.topconsumerreviews.com/debt-relief/. 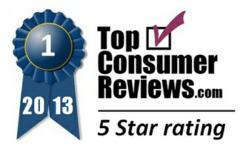 TopConsumerReviews.com, LLC is a leading provider of independent reviews and rankings for thousands of consumer products and services. They offer the latest on debt relief services including information, education, and ratings for the best debt relief programs available today.